Wiclear will now ask you to enter the coordinates of the database to use to host Wiclear. prefix is a string that will prefix each Wiclear's table name so that you can install several software inside the same database without any name clash. For example, my ISP gave me only one database and I installed dotclear and wiclear on the same database. Each dotclear's tables are prefixed by dc_ and each wiclear's tables are prefixed by wc_ which ease backup/restore. You can leave it empty. Once you have finished filling the form, hit the "Create tables" button. Wiclear will first test the connection to the database before attempting to create the tables. 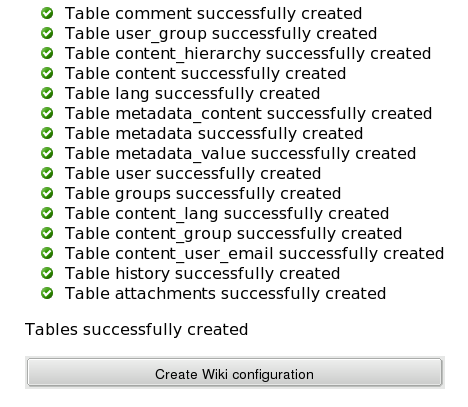 You can now hit the "Create Wiki configuration" button, this will give you the next page (click to continue).